Austria's most beautiful baroque town! Located in the region of Oberösterreich (Upper Austria), in the Innviertel area close to the border with Bavaria, the Baroque town of Schärding is a truly extraordinary place. Its architecture is a mix of many styles and periods, the highlight probably being the Baroque “Silberzeile” row of houses, an astonishing ensemble of Baroque buildings. Rich market traders used to live there, lending its name to the place because they had pockets full of silver. The late-medieval colors of the old gates, the narrow and mysterious side streets – all this makes Schärding such a very special place indeed. Many cyclists flock to Schärding all year round – the baroque town is a perfect starting point for cycling trips along the Danube, Inn and Tauern trails. The old Roman trail is another exciting way to discover this picturesque place, and many cycling trails are especially family-friendly. There is a wide range of possible sporting activities, making Schärding a great place to dwell for tennis aficionados, golfers and those of you who are into water sports. And why not take a boat ride between Schärding and the three-river town of Passau 15 km north of Schärding, or enjoy romantic walks on the beautiful esplanade along the River Inn. Schärding is a town that is offering surprises. This year our topic is "relaxation": six wonderful places invite to relaxation and well-being on the relaxation path. Swing on a five meter high swing between heaven and earth or relax on design loungers and beach baskets on the town square. Beach baskets, hammocks and sand sacks invite to get new energy on Schärding's most beautiful places. For small visitors we have a play station. Young and old can test their level of fitness. Small proverbs are to be found on all park benches and objects of art accompany you along the whole path. A feast for all your senses! In addition we offer you the 7 wonders of the antique world - only to be seen in Schärding! Are you ready for a surprise? The baroque town offers a special charm of history and joie de vivre Schärding welcomes all visitors in bright colors and with open arms. Tempts you to stay even longer and doesn't leave you even when going home. If you have been a guest in Schärding, you know what it means to be away from home but still home. The baroque jewel at the river Inn is a lovely town. Breath history with every step, but it'll never feel old and boring. 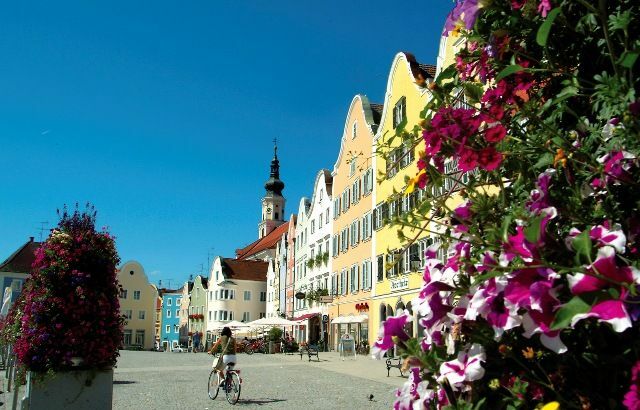 Exactly the opposite - when you walk through the historic lanes and paths, enjoy the different squares, promenades and parks, you'll feel the liveliness of Schärding.